COLOMBO, Aug 8 2013 (IPS) - Life for a widow with young children in Sri Lanka’s poor agrarian areas can be harsh. Families in remote areas like Anuradhapura in the North Central Province barely eke out a living through paddy cultivation or through vegetable and other crops planted in cleared jungle shrub – Chena cultivation as it is called. Both are backbreaking work in the hot sun, but working in the Chena can test the physical endurance of even the fittest. When Seelawathie lost her husband some years back, she had no option but to pit her strength against the Chena if she wanted to feed five children and herself. She quickly found she was not up to the task. Her father then gave her four paddy plots. The problem with paddy is that you need water, lots of it, to make a good harvest. Chena on the other hand could survive long dry spells. Luckily for Seelawathie, an ancient water reservoir near her village Kandawe in the North Central Province proved helpful. Her husband was a Chena cultivator, so water from the reservoir mattered little to him. But when Seelawathie began working the paddy plots, the irrigated water from the reservoir became critical. Such reservoirs were dug and built by ancient Sri Lankan kings. Most were built only to provide water for villages around them, though there are several large ones as well. They played a vital role in the agrarian economy before it was disrupted by the introduction of cash crops by the first European colonialists starting around 1500. The reservoirs were originally used by villagers to store water during the rains to be employed during the dry season for crops, especially paddy. “It was a godsend for me,” Seelawathie remarked. The tank water allowed her to continue paddy cultivation because water was available right through the year. 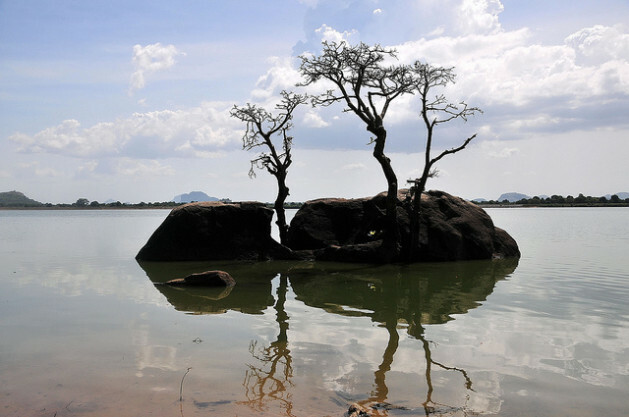 Thousands of such centuries-old reservoirs are spread through Sri Lanka’s dry but agro-rich areas mainly in the Northern, North Central, North Western, Eastern and Southern provinces. Now researchers say they can be an effective tool against fluctuating rain patterns caused by climate change. Research by the International Water Management Institute (IWMI) in Colombo has found that these reservoirs can be used not only to store water for the dry season but also to divert excess water during floods. Nishadi Eriyagama, an IWMI water resource engineer who has worked on the reservoirs, told IPS that these water tanks, if properly maintained, could become the main source of water for villagers like Seelawathie, while safeguarding their crops, property and lives during floods. “They can provide irrigation water during the dry season and also store excess flood water during floods so that crops are not adversely impacted,” she said. In recent years, both floods and drought have been equally devastating for Sri Lanka’s rice crops. In early 2011 the bulk of the harvest was lost to floods. Last year a 10-month drought brought the rice harvest down 6 percent to 10 percent. It is not only national harvest losses that are mounting. Most of the victims of the floods and the drought have been from the poverty-stricken dry zone, and make a bare living out of agriculture. One lost harvest can be a major blow; two in close proximity can be devastating. The trail of destitution left by extreme weather events has been a long one in the last two years. The Sri Lanka Red Cross estimates that 1.3 million people were affected by the drought. In January this year the government and the World Food Programme (WFP) conducted a survey in 10 out of the 18 districts impacted by the drought and then year-end floods. Of the 557,000 surveyed, 75 percent were either severely food insecure or borderline food insecure. Over 172,000 persons, or 31 percent of the total, were severely food insecure. And close to three quarters of those impacted by floods said that they had been hard done by the drought – and then the skies opened up. “A review of the reported natural disaster impacts during the past eight years indicates a trend of increasing frequency of events,” the U-N. warned in its latest Sri Lanka Humanitarian Bulletin. In the last two years over 2.6 million have been affected by natural disasters, the U.N. said. That is more than one tenth of a population of a little over 20 million. The impact may be rising, but outside assistance to ease the impact is not. In January this year the WFP had to suspend a programme that was to assist the 172,000 persons deemed severely food insecure because it did not have enough funding. “We see that changing weather is having some drastic impacts and we need to come up with home-grown solutions fast,” L.P. Rupasena, deputy director of research at the Hector Kobbekaduwa Agrarian Research and Training Institute in Colombo, told IPS. Such grassroots programmes may involve reviving age-old traditions that have been sidelined, as with the ancient reservoirs. No one really has a clear count how many there are, but their importance to agriculture has been replaced by emphasis on large irrigation networks, especially since the late 1970s. Eriyagama told IPS that some of the tanks have been abandoned. In the last decade there have been sporadic efforts to repair them, but the researcher said what was needed was a concerted effort to regain the position they enjoyed in the past. “Restoration of the ancient tank storage system has been on the agenda for some time. Although sporadic efforts have been made towards this, such as restoring individual tanks, a coordinated and systematic effort has not got off the ground yet,” she said. Ancient Kings are said to have killed Tamils too. In Sri Lanka we tend to loo backward. Soon we will drive looking in our rear view mirrors as well. No magic fighting of climate change here just simple adjustment. I see no mention of raising sacrifices for any god. Something we should always be doing but don’t because greenies believe in magic- magic that stopped New York being prepared for the massive storm surge. The massive storm surge was due in part to the global warming you seem to be denying.